A spare area of sod or bare earth in your yard has wonderful potential to be turned into a source of the freshest produce possible, saving time, money, and gas in the process. You can grow nutritious, pesticide-free produce in your own backyard. Choose your garden size based on how much time you have to devote to it. It’s often best to start with a small plot — 25 to 50 square feet, for example — and expand it gradually rather than overwhelming yourself with an area that you can’t water and weed regularly. 1Plan your garden to scale on graph paper to find the layout that best utilizes your space. Traditional vegetable gardens orient the plants in rows, but there’s no reason why you can’t do something different. Consider orienting rows north–south to expose the plants to maximum sunshine, and plan to put taller or climbing plants against fences or at the garden’s north end to avoid having them shade smaller plants. 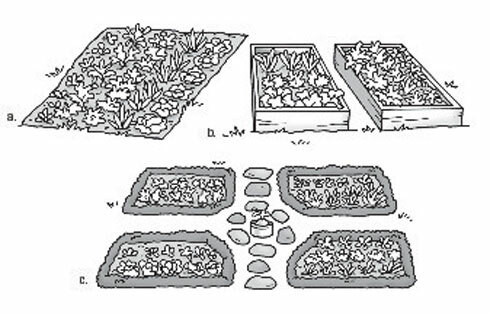 You may decide to grow plants in a raised bed — a bed built up about 8 to 12 inches high, filled with a mix of soil and compost, and surrounded by a border of wood, bricks, or rocks to keep the soil in place. 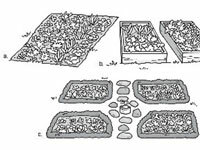 The soil in raised beds warms faster in the spring and drainage is generally better than in in-ground plots. 2Analyze your soil to find out what you’re working with and whether it needs amending. Pick up a handful of soil and squeeze: It should feel moist and stick together but should also be easy to crumble apart again. Sandy soil that doesn’t stick together can be too dry and often drains too fast, so you need to add richness (compost, for example); clay sticks together too much because it retains too much water, so you need to add drainage material (coarse sand and compost, for example). Consult the staff of a local garden store about the best options for your soil. 3Dig the bed over, breaking up the compacted soil with a hand tiller or rototiller for large areas. Remove rocks, and take out weeds by their roots. 4Start seeds indoors about six weeks before planting time. Time your planting for after the last frost. Take planting and growing directions from seed packages, including thinning the seedlings so that the mature plants don’t crowd each other. 5Sow or plant your garden according to the plan you created in Step 1. To make the harvest manageable, especially if you’re not canning or freezing, divide your plantings and sow or plant in successive weeks so that produce doesn’t ripen all at once. 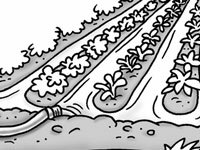 6Water your garden regularly, and fertilize according to the plant’s requirements. Use a soaker hose or irrigation system that gradually and consistently delivers water to root systems without wetting the plants’ leaves, which can cause mold growth.